The company behind controversial end-of-days simulator Left Behind and the developer of Christian rock Guitar Hero knock-off Guitar Praise have merged, forming one giant powerhouse of Christian game development. Left Behind Games and Digital Praise are two of the biggest names in the Christian video game market. Left Behind Games made news in 2006 with the release of Left Behind, a violent PC game in which the player participates in the final holy war between the forces of good and evil. 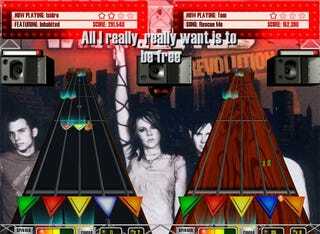 Digital Praise hit the Christian gaming scene big in 2005 with Dance Praise, a Dance Dance Revolution clone featuring Christian music, following that up with Guitar Praise in 2008. Now the two companies announce a merger agreement, bringing together the two biggest names in Christian gaming under one banner. "Digital Praise has the four key ingredients that will take our company to the next level," said Left Behind Games CEO Troy Lyndon. "Those keys are: (1) strong brands and products, (2) multi-channeled distribution, (3) a solid management team and (4) a history of generating millions of dollars in the emerging Christian video game market, a feat no company has matched." Strong religious themes are generally avoided in the mainstream gaming industry (Dante's Inferno barely counts), so companies like Left Behind and Digital Praise service a growing segment of the population that we barely ever hear about. The merger between the two companies is big news for the Christian games industry. Think EA merging with Activision, only much smaller and with a deep-rooted fear of lions.